Leading H-2A and H-2B service provider: Guaranteed labor supply PLUS comprehensive labor management support systems. Seasonal employers need a legal and stable workforce. Proceed to STEP TWO if you are a returning program participant or are a new participant that has received a consult. This completed form must be emailed to Ryan Ogburn at rogburn@wafla.org. We have developed cost-saving programs in efforts to reduce the financial burden to employers. Understand the Program Basics (see below). Attend our Annual H-2A Workforce Summit(s) - WA & OR (January). Access Economic Contributions of Washington H-2A Workers report prepared by ECONorthwest. Click here. Employers that use the H-2A program must secure inspected and approved housing, at no cost to all workers who are not reasonably able to return home daily. Housing must be secured 45 days before the date of need. This includes public housing such as hotels and motels that are properly licensed and open to the general public. Click on graphic below to access guide. Rates (AEWR) 2019 rate is $15.03 for WA & OR. Click here for Federal Register listing all states. 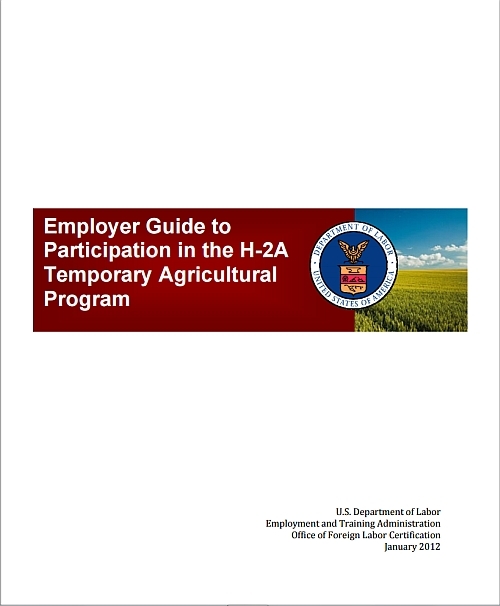 Determine if a prevailing hourly wage or piece rate has been adjusted for the crop activity or occupation identified in the employer's Application for Temporary Employment Certification, the employer must periodically visit the Department of Labor's Agricultural On-Line Wage Library (AOWL).